Published by Edition Svitzer. Released in 2013. Find more information & purchase it here or at Lone Star Percussion. 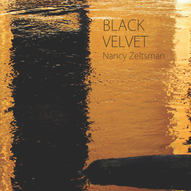 Nancy composed this piece in 2004 and dedicated it to her black Lab, Mochi. The piece is a sort of lullaby. It is about 5:30 in length, at an intermediate-to-advanced level, in a slightly-modern tonal language including many mixed meters. Nancy's recording of the piece on her CD "Sweet Song" includes a track of Mochi himself snoring!